With their victory over the Raiders, the Cadets are unbeaten in their last 17 contests. With a capacity crowd of more than 500 on hand at Highland Arena in St. Paul for the highly-anticipated matchup between St. Thomas Academy and Cretin-Derham Hall, there were plenty of folks letting out a boisterous yell at every close opportunity. But when Wednesday’s game came to an end, the chance that solicited the smallest reaction made the difference. Less than a minute in, Cadet senior forward Payton Matsui got a puck to the net. It bounced off Raiders senior goalie Tom Cavanagh’s skate and into the net to give St. Thomas Academy an early 1-0 lead. The goal left the mostly-noisy crowd stunned and proved to be the game-winner as the Cadets picked up a 2-0 road win against Cretin-Derham Hall. Coming in, there was plenty of anticipation for this matchup between St. Thomas Academy, which is ranked No. 2 in the Class 2A coaches’ poll, and the No. 5-2A Raiders. Aside from the two schools being close in proximity, many of the players in Wednesday’s game grew up playing with and against many of the other guys on the ice. With those factors in mind, the crowds on both sides were locked in and on edge for every play. But as Matusi’s early goal went in, the Cretin-Derham Hall (16-3-1, 10-0-1) crowd was quickly quieted. Following St. Thomas Academy’s early goal, the Cadets (17-1-1, 7-0) found themselves fighting off a myriad of chances from the Raiders. But despite their best efforts, they couldn’t crack St. Thomas Academy senior goalie Atticus Kelly, who picked up his second shutout of the season while making 27 saves. The biggest stop for Kelly came in the middle of the second period. With Cretin-Derham Hall pressuring the net, the Cadets got called for one of their skaters covering the puck with their glove, which led to the Raiders getting a penalty shot. Kelly made his biggest stop of the night when he stonewalled Cretin-Derham Hall sophomore forward Nick Davison. Soon after Davison’s missed penalty shot, St. Thomas Academy got another one past Cavanagh. The goal was credited to Cadet junior forward Brendan McFadden, but he was a facilitator on the play, passing it to junior forward Nico Vega who blasted it into the net. Wednesday’s win is the 17th consecutive game without a loss for St. Thomas Academy. The Cadets’ lone defeat this season came to No. 4-2A Minnetonka, 4-3, on Nov. 24. While St. Thomas Academy continues to roll on, the road doesn’t get any easier for the Cadets. They play again in less than 24 hours against another nearby foe, Hill-Murray. On Saturday, St. Thomas Academy will head north and take on No. 17-2A Duluth Marshall. 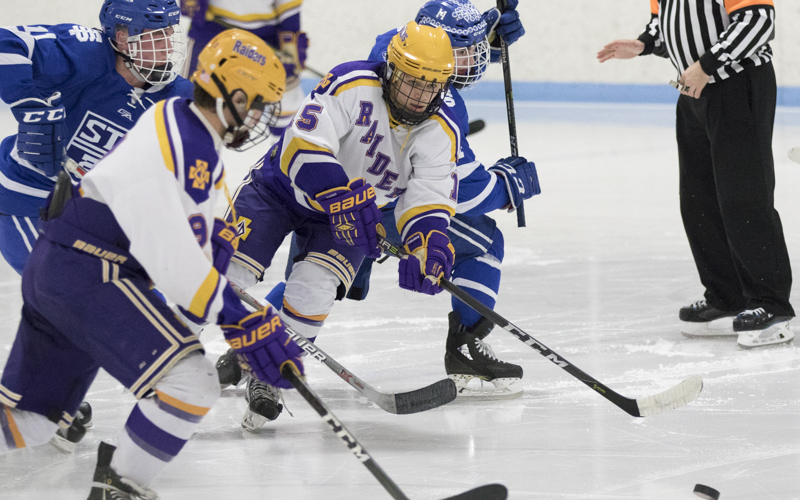 After scoring what would be the eventual game-winning goal 23 seconds into the game, St. Thomas Academy held Cretin-Derham Hall off the scoreboard and tallied an insurance goal as the Cadets defeated the Raiders 2-0 on Wednesday at Highland Arena in St. Paul. 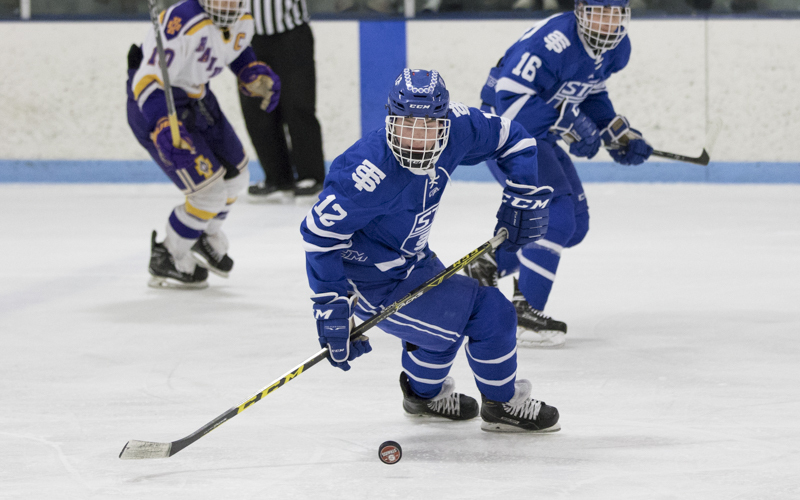 Senior forward Payton Matsui got the early goal for St. Thomas Academy (17-1-1, 7-0) to give his team an early 1-0 lead as the puck bounced off Cretin-Derham Hall (16-3-1, 10-0-1) senior goaltender Tom Cavanagh’s skate and into the back of the net. In the second period, junior forward Brendan McFadden added to the lead for the Cadets, who are ranked No. 2 in the Class 2A coaches’ poll, when he beat Cavanagh and made it 2-0. Cadet senior goalie Atticus Kelly slowed down the No. 10-5A Raiders. 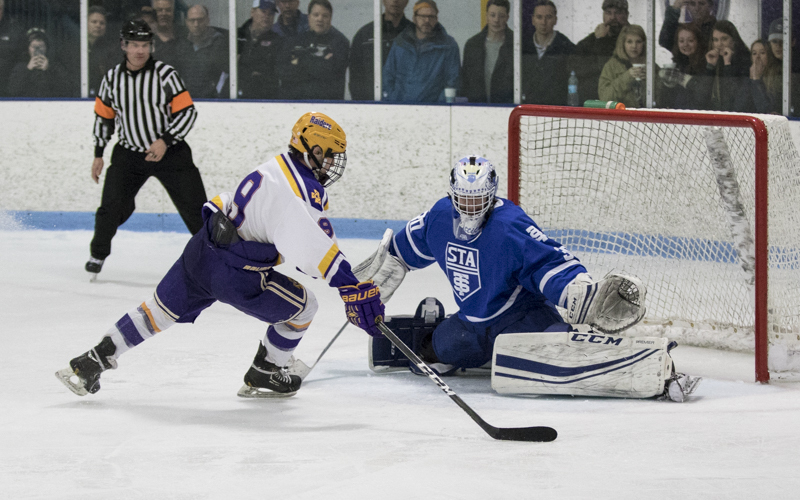 He made 27 saves in the shutout win, including a stop on Cretin-Derham Hall sophomore forward Nick Davison during a penalty shot in the second period. With the win, the Cadets extended their unbeaten streak to 17 games. They haven't lost since their season opener, a 5-4 decision to Minnetonka on Nov. 24.